Just wait ’til the second race! four cars entered and they filled the first four places in the race. This dominant performance was achieved on 2 September in the second of two All-Comers’ races at Brands Hatch. Boss Racing and its clients had been determined to do well in the MSVR-organised Lotus Festival on our home track. There were entries for Colin Watson in our “Spa Special” Caterham C400 with 2.4 litre Duratec engine, Jonny Pittard (Caterham Superlight R 2000), brother Christian (Caterham CSR 2300) and Tim Davis (C400 2000). We’d put them all on slick tyres for the Friday test day but later we made a startling discovery: the new tyres for the race were the wrong size. They only fitted Colin’s car, with its bigger arches. I managed to get our supplier to deliver new ones overnight but they arrived just too late for qualifying. Even so, with Colin putting up third fastest time, the others took the next three places on the grid in the order Jonny, Christian and Tim. In the hard-fought first race, Colin finished just 0.3sec behind the winning Radical, taking second place on the 16th of the 24 laps. Christian was gaining on him in the closing stages but going through Paddock Hill Bend, the two made contact, costing Colin both his rear wings. On the next lap Christian had a spin at Paddock but he recovered to finish fourth, behind Jonny and ahead of Tim. Christian was also credited with the fastest lap. Colin started the second race from the first row of the grid and darted straight into the lead which he held throughout the race. It was a straightforward victory for him and a great result made even better with Jonny, Christian and Tim backing him up. Colin also made the fastest lap of the race. Yet just seven days later we had one of those week-ends where you just have to shrug your shoulders and say: “That’s motor racing!” Not that our entrants for the Classic and Sports Car Club’s late summer meeting at Donnington Park’s National Circuit scored a poor set of results. Far from it. But an even better haul was there for the taking. In Thursday testing Christian went out on used tyres and was soon lapping confidently, while new client Will Redman in our number 91 C400 2000 was playing himself in gently as he hadn’t raced for some time. Qualifying for the Gold Arts Magnificent Seven race was on a classic ‘damp but drying’ track, teasing drivers to manage ever changing grip levels and make decisions on tyre choice. At the end of the session Tim was fifth and first in class, Jonny sixth and Christian eighth. But after qualifying we noticed that Jonny’s car was leaking oil. We had little option but to withdraw the car to avoid the risk of further damage. Will Redman lined up 26th and Peter Hargroves (Superlight R) 30th. Having dried it then rained again in qualifying for the Meteor Suspension Open Series race with Christian and Tim Davis initially on dry weather tyres. Due to the large volume of traffic in the pit lane they didn’t get their wets until the session was almost over. As a result, Christian lined up 20th on the grid and Tim 33rd. As soon as the lights went out Tim and Christian started hauling themselves up from their lowly starting positions to the sharp end of the field. In fact, Tim was heading for a podium position but spun at Goddard’s on the last lap, allowing Christian to take third. So for the Mag Sevens event we were yet again looking at a wet drying surface with much discussion over tyre choice for what is a 40 minute race. Tim had a good race to finish fifth and first in class with Christian classified 10th. But it could have been better. Both had elected to start on wet tyres but the track was drying. By lap eight Tim was in the lead when he pitted came in for his stop, but changing to dry tyres dropped him back. A collision while lapping a back marker took Christian out of contention. Then additional time was lost when both he and Tim received 90-sec penalties for excess speed during a period of Code 60 running. Even so, Tim won his class and put up the fastest lap. Peter, meanwhile, finished 16th and fourth in class, while Will was 21st. He counted the week-end a successful one. He hadn’t damaged the car, he’d kept in on the track and he’d finished the race better than he qualified and his beaming smile was a real highlight on a slightly frustrating meeting. 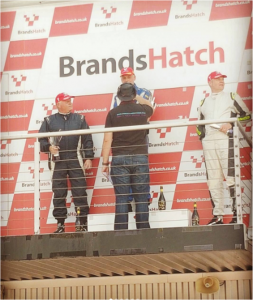 Other Boss Racing clients had mixed fortunes at the BARC meeting at Brands on 23/24 September. Rod Birley took a brace of second places in the Cannon Tin Tops rounds in the Peter Bevan-owned Honda Integra R, which is powered by an engine built by my dad, Dave Singleton. Paul Adams had entered his mighty turbo-charged Ford Focus for the week-end’s two BARC SE Quaife Modified Saloon Car Championship rounds. We’d done some suspension geometry work on this car which Paul qualified third for the first race. But he could do no better than 11th thanks to the exhaust system trouble that eliminated him from the second race. Our next outing will be at the CSCC’s Oulton Park meeting on 7/8 October.